More than ever before, the tech industry is focusing on diversity. As sustainability and impact professionals, we continue to push our leaders to make racial and gender equity the business norm. Companies in our sector have changed recruiting policies, increased training budgets, hired new diversity team members, established goals, and released metrics on progress. Our industry, however, is still struggling to increase both gender and racial. 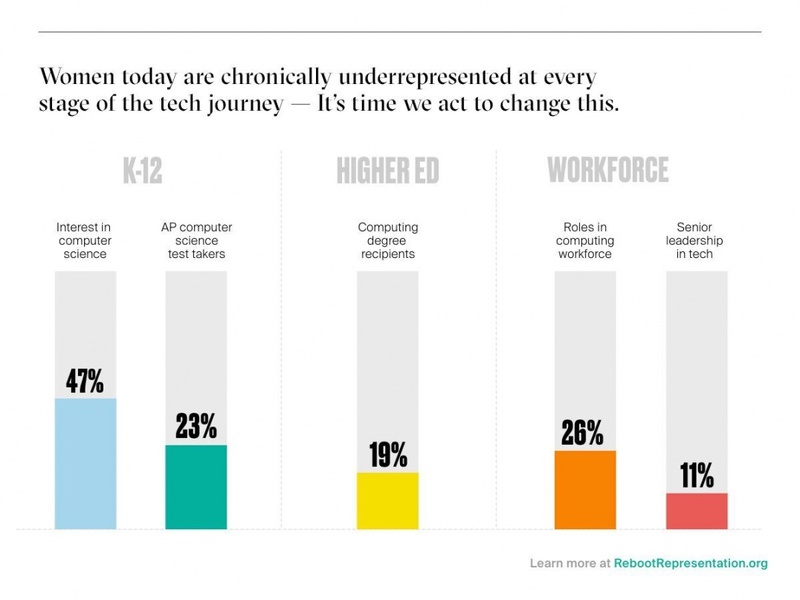 Today, women hold only 19% of computing degrees with women of color holding just 4%. Even more alarming, over the past decade, the percentage of Black, Latina, and Native American women receiving computing degrees fell by nearly 40%. As one of the first founding members of the Women’s Empowerment Principles, we realized along the way that women of color were not being included in the conversation and that working collectively is a key part of transforming the tech industry. Symantec recently participated in a research report on closing the gender gap in tech. The report, released today by Melinda Gates in partnership with McKinsey & Company, includes insight from 32 leading tech companies. and tech company contributions to the gender/tech space are fragmented and there is little alignment among donors. The report’s recommendations include aligning tech companies’ existing philanthropic donations to maximize our impact, reach more women and girls, and transform the industry to better serve society. We’re proud to announce that we’ve joined The Reboot Representation Tech Coalition, a collaborative effort with a goal to double the number of women of color (black, Latina and Native American) graduating with computing degrees by 2025. In partnership with Pivotal Ventures (the executive office of Melinda Gates), Adobe, Intel, Salesforce and others, the Coalition has committed $12 million to efforts that engage underrepresented women of color directly. In addition to joining this important coalition, Symantec is working to evolve our CR program’s philanthropic partnerships and initiatives to help us build a more inclusive workforce and specifically engage women of color in tech. We have worked to strengthen current partnerships, as opposed to always building new ones, to deepen our impact. What started as a general grant to Code.org has evolved to become a joint partnership focused on increasing the number of girls in STEM, particularly for female students of color. Symantec grants helped fund the development of the organization’s CS Discoveries course, in which 6-10th grade students learn about programming, web development, and data, as well as CS Principles, a rigorous, yearlong course covering, the internet, big data, privacy, and programming. In the 2017-2018 school year alone, more than 36,500 female students of color participated in CS Discoveries, and an additional 19,000 participated in CS Principles. Similarly, our longstanding relationship with Net Impact began with a general grant to help the organization equip young leaders to thrive at the forefront of social change efforts. Our partnership morphed over time to focus on racial equity and our support helped establish undergraduate chapters at Historically Black Colleges and Universities (HBCUs). Bennett College, one of only two all-women HBCUs now has a Net Impact chapter because of grants from Symantec. We've also supported the creation of the Racial Equity Awareness Leadership (REAL) Program, a scalable effort with the goal to institutionalize racial equity at colleges and universities through training and curriculum. Our Symantec Cyber Career Connection (Symantec C3)technical training program works to create a diverse pipeline of cyber security talent. Working with leading educational development non-profits Year Up, NPower, Per Scholas, The Stride Center, and the NASSCOM Foundation, the program prepares students for entry-level cyber security careers and includes a specific focus on training women of color. At the end of FY18, 60% of female Symantec C3 graduates were women of color, defined as Black, African American or Hispanic. At Symantec, we are working hard to improve our diversity numbers, push our CR partnerships to do more, and to join with peers to use our philanthropic and CSR spending to grow the number of women of color receiving computing degrees. We know we need to do much more as a company, and that we’ll be able to achieve better results by working together. Help us reboot the tech industry andclose the gender gap for women of color. To learn more about joining the Reboot Representation Tech Coalition visit www.rebootrepresentation.org.